Sigma is reorganizing its lens range in to three product categories; Contemporary, Sports and Art, the latter of which this new model is a part of is reserved for its highest performing lenses. With its angle of view equivalent to a 45mm on a full-frame 35mm camera, the 30mm f/1.4 DC HSM A has been substantially revised with a new optical construction of 9 elements in 8 groups (over the previous 7 elements in 7 groups), closer minimum focus distance of 30cm (down from 40cm) and 9 diaphragm blades as opposed to the earlier iteration’s 8 blades. New algorithms are said to improve the AF performance of the built-in ultrasonic type motor, while compatibility with the firm’s innovative USB Dock allows focus adjustment and updating of firmware. Lastly, a high quality outer shell and finish has been adopted in accordance with others in the Art line, but despite the improvements, the price remains the same as the older model at $499. A DxOMark Score of 19 indicates that this is a high-watermark for a fast aperture lens like this. Distortion, lateral Chromatic Aberration and Vignetting (or lens shading as it’s sometimes referred to as these days) are all very controlled. 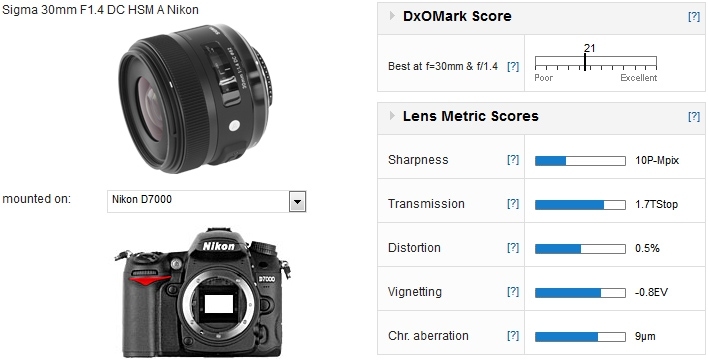 Despite attaining the same scores on the individual metrics as the Canon version, the Nikon mount achieves a slightly higher benchmark score on the Nikon D7000. 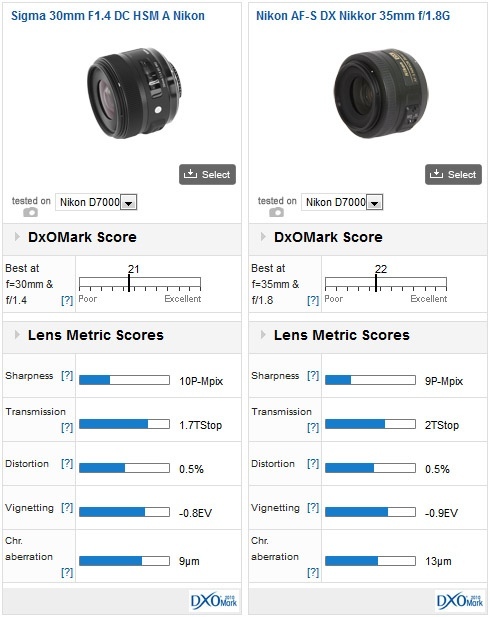 In reality, the lens performs similarly but the DxOMark Score is higher slightly due to the Nikon sensor’s wider dynamic range. 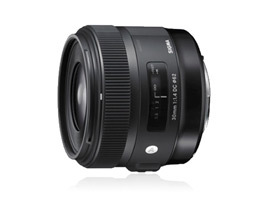 The Sigma 30mm f/1.4 is one the better performing lenses currently available. 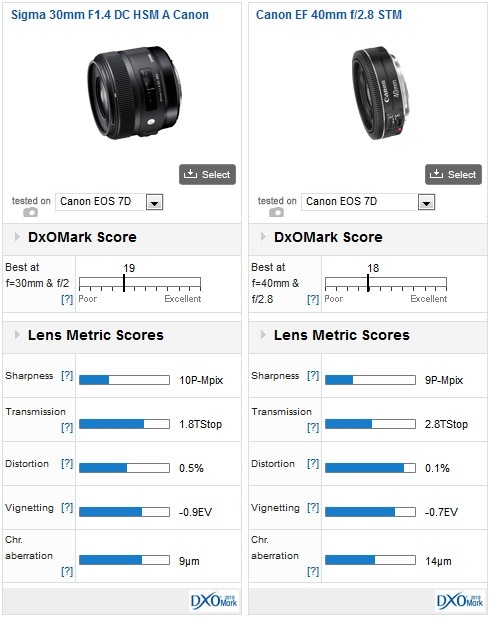 Comparing the Canon mount model to the full-frame $249 Canon EF 40mm f/2.8 STM (the firm doesn’t have a comparable APS-C format model in its range) the Sigma is a better performer but the tiny Canon ‘pancake’ is no slouch. Sharpness is close although the Sigma is a somewhat disappointing at full aperture whereas the Canon has consistent edge to edge sharpness through the aperture range Needless to say the Sigma is (1.33 stops) ‘faster’ than the Canon, and so overall it’s an impressive result. Although Nikon has few APS-C format prime lenses in its range it does have a modern, ultrasonic type AF motor equipped 35mm f/1.8 model that’s sensitively priced at $195. In spite of the faster maximum (f//1.4) aperture, the Sigma compares very well indeed. There’s nothing between them in Transmission, Distortion and Vignetting but the Sigma has lower levels of Chromatic Aberration and has slightly improved Sharpness (although, like the Canon mount version, the Sigma has inconsistent field sharpness at full-aperture). Several years on from the introduction of the original 30mm f/1.4 and Sigma has still yet to see a comparable high-speed model from either Nikon or Canon. That said, both firms offer smaller, lighter and cheaper models that perform very well indeed. For all that, the new Sigma is still accessibly priced, remains relatively compact and offers very good optical performance.